Have you noticed the new, almost back to normal, header? Thought it was time to go back to a normal “Zefi’s Blog” banner again, seeing as its back to normal for the blog now the holiday is over. I’m back to my normal life again. Back to rain, mud, cold, horses, chickens, ducks, dogs to feed, partner to feed, firewood to bring in, fire to keep us warm, cleaning, washing… and a sick partner. Poor Wayne, he’s got the flu. Not very nice for him with all the aches and pains, coughs and mucus. Not very nice for me hearing him moan. I’ve been making healthy home cooked meals. Isn’t it the law that you feed sick people soup? Well, I made an almost entirely home cooked soup for dinner tonight… I actually found it in the Campbell Soup Recipe book years ago. Its like a supercharged tomato soup. Browned onions, carrots, red lentils and a can of tomato soup. Yum. 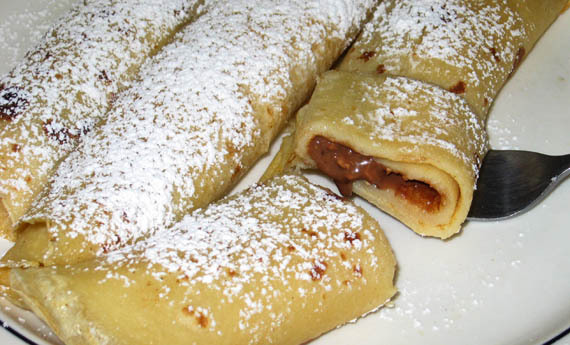 Then, for dessert I whipped up some crepes. The pantry was rather bare of toppings…. I didn’t have any chocolate sauce or nutella (the obvious choice for chocolate crepes), no bananas or ice cream, no cream to go with jam. What I did have were a couple of half eaten blocks of chocolate. One dark and one milk chocolate with hazelnuts. 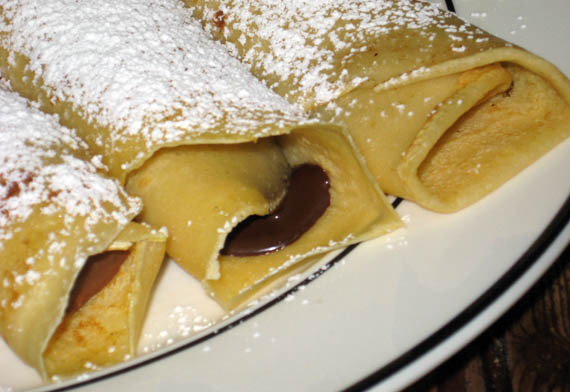 When the crepes were cooked I rolled each up with pieces of chocolate in it… By the time we were ready to eat them the chocolate had melted nicely. In order to serve, I dusted them with icing sugar – things always look better dusted with icing sugar. They were very good. But more chocolate would be better. Yes, more chocolate would have been better.